Chocolate comes from the Aztec word xocolatl which means bitter water. The tropical tree from which cocoa and chocolate originate is called Theobroma which translates to "food of the gods". All chocolate begins with tropical cocoa beans. The flavor and quality of the chocolate depends on the type(s) of beans used, how they are harvested and fermented, the roasting procedures, quality and amounts of ingredients added, and the time of conching. Cocoa beans grow in pods on the cocoa tree. The cocoa tree grows in countries within 600 miles of the equator. There are three types of cocoa trees: the Forastero, the Criollo, and the Trinitario. Each tree will yield between 1-2 pounds of dried beans a year. The Forastero tree produces over 80% of the world's production and comes from Africa, Brazil, West Indies, Central and South America. 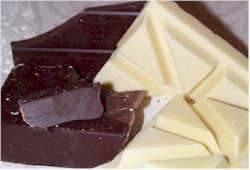 It is the main component of the cocoa blends and gives body to the finished chocolate. A good basic bean. The Criollo tree produces about 10% of the world's production and comes from Central and South America. A more fragile tree but it produces the best quality beans. The Trinitario tree produces about 10% of the world's harvest and is a cross between the Forastero and Criollo. Grown in Sri Lanka, Indonesia, Central and South America, with the highest quality coming from Trinidad. Chocolate is made from a blend of different types of cocoa beans. The blends with higher amounts of Criollo and/or Triniatrio beans will have a more aromatic and complex flavor. Cocoa beans are very bitter when raw. The chocolate flavor and aroma develops after the beans are fermented, roasted and aged. After roasting the beans are shelled (a process called winnowing) leaving the inner nib or kernel containing 50-55% cocoa butter. This is the point where different types of beans are blended together. The quality and type of bean will help determine the quality of the finished chocolate. Every manufacturer has their own special formula. Once the nibs are removed from the shell they are ground releasing the beans natural fat, called cocoa butter. What remains is a thick dark brown paste called chocolate mass or chocolate liquor. This paste contains all the aroma and flavor of the chocolate. At this point, if additional cocoa butter is removed from the chocolate liquor, the solid cocoa powder "cake" is pulverized and sifted to produce unsweetened cocoa powder. Depending on the type of chocolate desired (semisweet, unsweetened, etc), other ingredients are now added and the chocolate liquor is refined. This process is called conching and removes any residual moisture and volatile acids and also breaks down any remaining solid pieces of cocoa butter. The time of conching varies from several hours to several days and plays a big part in the quality of the finished product. "It has been shown as proof positive that carefully prepared chocolate is as healthful a food as it is pleasant; that it is nourishing and easily digested...that it is above all helpful to people who must do a great deal of mental work."